Genuine Mayan Red Pigment. This rich rose shade is suitable for all media and is lime/plaster and concrete proof. 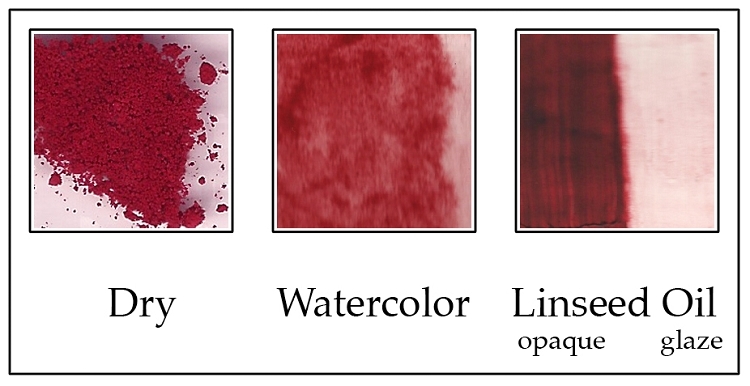 Similar shade to genuine Rose Madder or Alizarin Crimson. A: All of the Mayan Pigments are quite transparent and have a low tinting strength. In milk paint, they require a high concentration of pigment, in conjunction with an opacifier, such as marble dust. That being said, the Mayan Pigments work extremely well in Milk Paint and have become the cornerstone for the Casein Paint palette that we manufacture. Q: In your very satisfactory answer to my first question, you mentioned that the Mayan pigments, being "quite transparent" and having a weak tinting strength, need to be used in conjunction with an opacifier, such as marble dust in milk paint. I generally use calcium carbonate in my milk paint formula. Is marble dust more opaque than whiting/calcium carbonate? Does it differ in any other ways that make it superior to chalk whiting? It is my understanding that both are calcium carbonate... perhaps I'm misinformed on that? A: You are correct, both the chalk and marble dust are calcium carbonate. Our chalk is a bit denser and whiter than the marble dust and therefore lends itself better for making chalk grounds with rabbit skin glue. The marble dust is a bit fluffier than the chalk and therefore tends to separate less, after being in suspension for a while. Q: I've been have trouble making this pigment into a watercolor. It doesn't what to spread in the water but ox gall doesn't seam to help and just makes it want to clump and float off. Any recommendations or is that just how this pigment behaves? A: It sounds like the pigment was not dispersed well enough. Always mix the pigment with water first, before adding your binder (gum arabic in this case). If the pigment does not disperse easily, add some denatured alcohol to your dispersing water (about 10%). This will thoroughly disperse the pigment and then the oxgall will act as a surfactant, which will help spread the paint more easily. A: Even though the Mayan Pigments are dye based, the matrix that is formed between the dyes and the diatomaceous earth, makes the resulting pigment lightfast and stable enough to be used in fresco plaster.